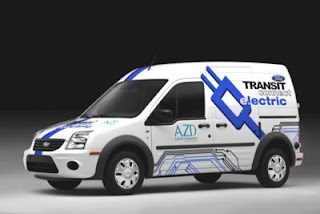 Uftring Auto Blog: Electric Cars In Peoria...Wait, That's A Van! Electric Cars In Peoria...Wait, That's A Van! Waiting for an electric car to arrive in Peoria? While the Nissan Leaf and Chevy Volt won't be here for quite some time, there is another answer, especially if you need a vehicle for your business. If you're absolutely craving electricity now, you can satisfy your longing with the Ford Transit Connect Electric van. That's right, an electric van has beat the electric cars to the punch in central Illinois. 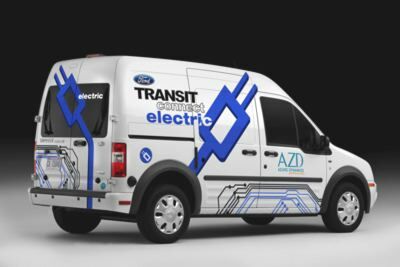 Uftring Auto Group has entered into a partnership with Azure Dynamics to offer the Ford Transit Connect Electric van to customers in the Peoria area. The electric vehicles will be available for sale through the Uftring Automall in East Peoria. We'll be the exclusive dealer of the Ford Transit Connect Electric in downstate Illinois! The modified Ford Transit Connect Electric runs completely on electricity, eliminating the need for gas. It utilizes Azure Dynamics Force Drive battery electric drivetrain. The high voltage lithium-ion battery can be charged from a 120V or 240V AC input, the same type of outlet that large household appliances such as refrigerators use. This is the same great van that was awarded the 2010 North American Truck of the Year award, but with a bit more inspiration from Ben Franklin. The Transit Connect has been praised in the media and from automobile enthusiasts for its versatility and huge cargo capacity. It's great for storing and delivering anything from wedding cakes to plumbing materials. Want to become more eco-friendly with your business? Here's an easy way to do so. If you're interested in acquiring or learning more about a Ford Transit Connect Electric van, please contact Jeff Peters, Fleet and Commercial Sales Manager for the Uftring Auto Group. Call Jeff at the Uftring Automall at 888-526-0326 or email him at jeffpetersATuftringDOTcom.